An unusual religious headwear battle has hit a boiling point in Surrey, B.C., where a “Pastafarian” is fighting for his right to wear a colander in his driver’s licence photo. Obi Canuel, who is an ordained minister in the Church of the Flying Spaghetti Monster, says the Insurance Corporation of B.C. is denying him the right to be able to wear the spaghetti strainer on his head. The 36-year-old says he believed he would be able to wear the kitchen accessory when he renewed his licence last fall because ICBC affirms the right to religious expression. ICBC said its religious head covering policy strive to strike a balance between respect for the driver’s religious beliefs and a need to preserve the integrity of the licensing system. The company said it would not issue a new driver’s licence with the colander photo, but encouraged him to go into any office and have a free colander-free photo taken – and a new licence would be issued. “The truth is sometimes I have the spiritual inkling to wear the colander and I don’t think ICBC should be making decisions about what kind of religious headgear is appropriate or not,” Canuel told CTV Vancouver. Strangely, a photo of Canuel wearing the exact same strainer on his head was approved for his new B.C. Services card. As it gained popularity in the media, the Flying Spaghetti Monster became a symbol against intelligent design used in the public education system. At least four countries, including the U.S., allow Pastafarians to wear colanders in their driver’s licence photos. The Pew Forum’s religious knowledge survey included 32 questions about various aspects of religion: the Bible, Christianity, Judaism, Mormonism, world religions, religion in public life, and atheism and agnosticism. The average respondent answered 16 of the 32 religious knowledge questions correctly. Just 2% of those surveyed answered 29 or more questions correctly (including just eight individuals, out of 3,412 surveyed, who scored a perfect 32); 3% correctly answered fewer than five questions (including six respondents who answered no questions correctly). The scores on individual questions ranged from 8% to 89% correct. At the top end of that scale, at least eight-in-ten Americans know that teachers are not allowed to lead public school classes in prayer, that the term “atheist” refers to someone who does not believe in God, and that Mother Teresa was Catholic. At the other end of the spectrum, just 8% know that the 12th-century philosopher and Torah scholar Maimonides was Jewish, and 11% correctly identify Jonathan Edwards, viewed by many scholars as the pre-eminent American theologian, as a preacher during the First Great Awakening, a period of heightened religious fervor in the 1730s and ’40s. Overall, the three groups that perform best in this survey are atheists and agnostics (who get an average of 20.9 out of 32 questions right), Jews (20.5 questions right on average) and Mormons (20.3 questions right). Looked at another way, 27% of Jews, 22% of atheists and agnostics, and 20% of Mormons score in the top 10% of all respondents in overall number of correct answers to religious knowledge questions, getting at least 26 questions right. As will be discussed in detail later in this report, these groups display greater religious knowledge even when education and other factors are held constant. Mormons outperform Jews as well as atheists and agnostics on questions about the Bible but do not perform as well as the other two groups on questions having to do with world religions such as Islam, Hinduism and Buddhism. White evangelical Protestants answer an average of 17.6 religious knowledge questions correctly. Though white evangelicals have lower scores than Jews and atheists/agnostics overall, they do significantly better on questions about the Bible. White evangelicals correctly answer an average of 5.1 out of seven Bible questions, compared with 4.4 among atheists and agnostics and 4.3 among Jews. Mormons answer almost six of the seven Bible questions correctly on average. White mainline Protestants and white Catholics each closely resemble the public overall, getting about half of the 32 religious knowledge questions right on average (16 for white Catholics, 15.8 for white mainline Protestants). Those who describe their religion as “nothing in particular” answer an average of 15.2 questions correctly. Black Protestants answer an average of 13.4 questions correctly, and Hispanic Catholics get 11.6 right on average. Scores on this survey are higher among whites than among blacks or Hispanics even after controlling for other factors linked with religious knowledge, including education and religious affiliation. The Bible: Five questions on the Old Testament and two on the New Testament. Elements of Christianity: The Bible items plus questions about Catholic teaching on the Eucharist, Protestant teaching about salvation through faith alone, Mother Teresa, Martin Luther and the First Great Awakening. Elements of Judaism: The five Old Testament items plus questions about the Jewish Sabbath and Maimonides. Elements of Mormonism: Three questions on the founding of the Church of Jesus Christ of Latter-day Saints and the Book of Mormon. Knowledge of world religions: Items on the Jewish Sabbath and Maimonides (Judaism), Ramadan and the Koran (Islam), nirvana and the Dalai Lama (Buddhism), Vishnu and Shiva (Hinduism), Greek mythology (Zeus) and the religious composition of India, Pakistan and Indonesia. Atheism and agnosticism: Definitions of each term. Role of religion in public life: Questions on separation of church and state and constitutional restrictions on religion in public schools. Knowledge of nonreligious topics: Nine questions on politics, science, history and literature. The survey included seven questions about the Bible, tapping people’s knowledge on five topics from the Old Testament (the name of the first book of the Bible, the Ten Commandments and the identities of Abraham, Job and Moses) and two topics from the New Testament (the names of the four Gospels and the birthplace of Jesus). Nearly two-thirds of the public (63%) correctly name Genesis as the first book of the Bible when asked this question in an open-ended (not multiple-choice) format. More than eight-in-ten white evangelicals (85%), Mormons (85%) and black Protestants (83%) get this question right, as do roughly seven-in-ten atheists and agnostics (71%). By comparison, fewer than half of Catholics (42%), including 47% of white Catholics and 29% of Hispanic Catholics, are able to name Genesis as the first book of the Bible. A slim majority of the public (55%) correctly says that the Golden Rule, “Do unto others as you would have them do unto you,” is not one of the Ten Commandments. More than eight-in-ten Mormons (81%) answer this question correctly, as do roughly two-thirds of white evangelicals (67%) and more than six-in-ten white Catholics (63%), atheists/agnostics (62%) and Jews (62%). By contrast, less than half of white mainline Protestants and black Protestants (49% each) get this question right. Of the three Old Testament figures asked about in the survey, Americans are most familiar with Moses. Overall, more than seven-in-ten Americans (72%) know he was the biblical figure who led the exodus out of Egypt; 92% of Mormons and about as many Jews and atheists/agnostics answer this question correctly. Eight-in-ten white evangelicals correctly identify Moses, as do roughly three-quarters of black Protestants (73%) and about two-thirds of white mainline Protestants (68%) and Catholics (65%). Compared with Moses, Abraham is less well-known, with 60% of all Americans correctly identifying him as the biblical figure who was willing to sacrifice his son’s life for God. Fewer (39%) identify Job as the biblical figure known for remaining obedient to God despite extraordinary suffering. 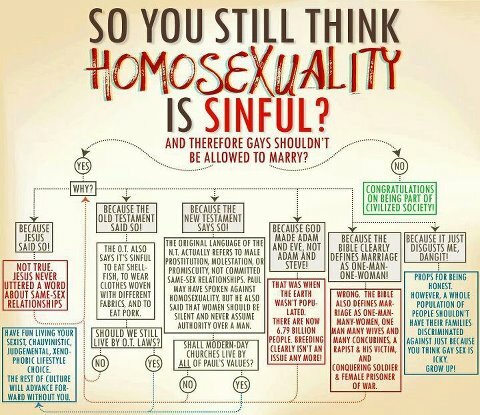 So You Still Think Homosexuality is Sinful? The British Humanist Association (BHA) has welcomed a new revision of the model funding agreement for Free Schools by the Government in order to preclude ‘the teaching, as an evidence-based view or theory, of any view or theory that is contrary to established scientific and/or historical evidence and explanations.’ This highly significant change has been made in order to ban creationism from being taught in Free Schools, and prevent creationist groups from opening schools. The change follows the BHA coordinating the ‘Teach evolution, not creationism!’ campaign, which called for this precise change. In September, the BHA came together with thirty leading scientists and science educators including Sir David Attenborough, Professor Richard Dawkins and Professor Michael Reiss, and five national organisations to launch ‘Teach evolution, not creationism!’, which called on the government to introduce statutory guidance against the teaching of creationism and garnered significant press coverage. The BHA also launched a government e-petition making the same call, which has now garnered over 20,000 signatures. Yes, this guy is “for real”.